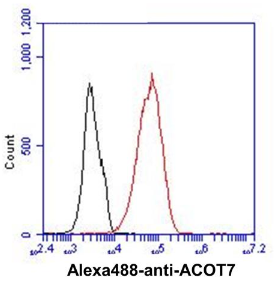 Search for all "ACOT7 / BACH"
Mouse anti Human ACOT7 / BACH AT1D5. Product is tested for Immunocytochemistry/Immunofluorescence, Flow Cytometry, Enzyme Immunoassay, Western blot / Immunoblot. Western blot: 1/500-1/2000 (starting dilution is 1/1000). ACOT7 is a member of the acyl coenzyme family. This protein hydrolyzes the CoA thioester of palmitoyl-CoA and other long-chain fatty acids. 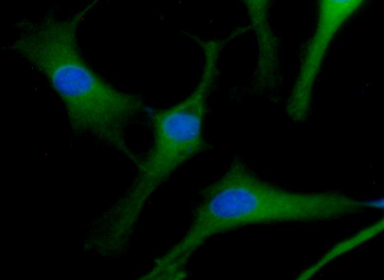 Decreased expression of this protein may be associated with mesial temporal lobe epilepsy. Alternatively spliced transcript variants encoding distinct isoforms with different subcellular locations have been characterized. Hunt MC, Yamada J, Maltais LJ, Wright MW, Podesta EJ, Alexson SE. A revised nomenclature for mammalian acyl-CoA thioesterases/hydrolases. J Lipid Res. 2005 Sep;46(9):2029-32. Epub 2005 Jul 1. PubMed PMID: 16103133. 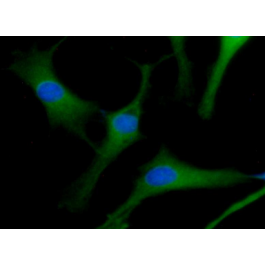 This antibody recognizes Human ACOT7 / BACH at aa1-370.